Until very recently all beer kits came in either 1.5kg, 1.8kg, or 2 x 1.5kg tin cans, and it was the amount of malt that determined the quality of the beer kit (and price). But these cans posed a problem - not all beer types require 3kg of malt extract, some needed more, and some less, but cans need to be full, and so we had to put up with what we were given. Well, no more. As worldwide tin prices have increased manufacturers have developed new ways to bring us new kits at better prices. And one of the first companies to do this was Hambleton Bard with their new 4kg Bulldog homebrew beer kit range in pouches. These pouches are a great new development as each beer kit can have the exact amount of malt needed for that style of beer. Also getting the malt ouf of the container is easier - just toothpaste tube it out. 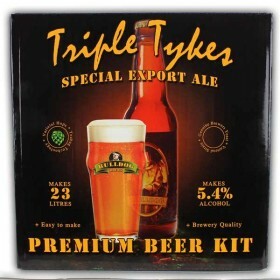 As well as the 4kg pouch of malt selected especially for the style of the beer kit there is also a sachet of beer yeast (also specially selected for the beer style), and a sachet of hops. The yeasts are proper varietal beer yeasts rather than the generic old home brew yeasts that make the same old dull beers. Bulldog Homebrew beer kits include amazing yeasts such as warm fermenting lager yeasts, and they have double the amount of yeast found in other beer kits. The hops are also included as an extra and are contained in a teabag that is seeped in boiling water for around 10 minutes. The hop water is then added to the brew on day 4 of fermentation. If added just before bottling the hop aroma is even more intense. 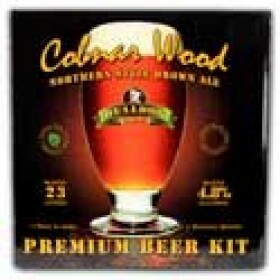 The Cobnar Wood Northern Nut Brown Ale kit contains a 3.8kg of malt, and makes 40 pints of Brown Ale.. 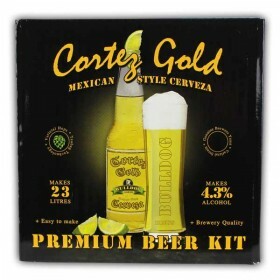 The Cortez Gold Mexican Cerveza kit contains a full 3.0kg of malt, and makes 40 pints of Mexican Cer.. 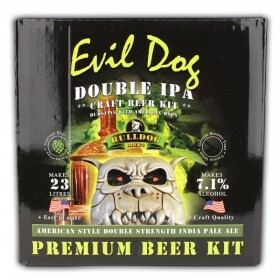 The new ‘Evil Dog Double American IPA' from Bulldog Brews is a real beast of a beer, brewing out at .. 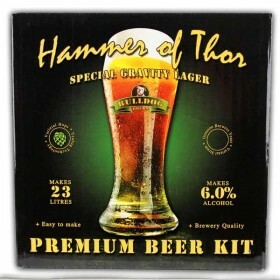 The Hammer of Thor lager kit contains a full 4.0kg of malt, and makes 40 pints of golden lager at 6%.. 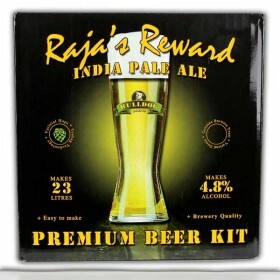 The Rajas reward Indian Pale Ale beer kit contains 3.4kg of malt, and makes 40 pints of IPA at 4.8% .. 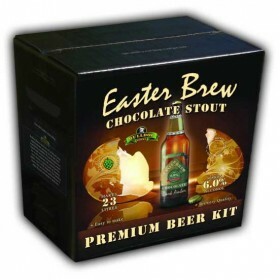 The Triple Tykes Special Export Ale kit contains a full 4.0kg of malt, and makes 40 pints of Export ..
Easter Brew Chocolate Stout is a new addition to the Bulldog Brews super quality range of beer makin..